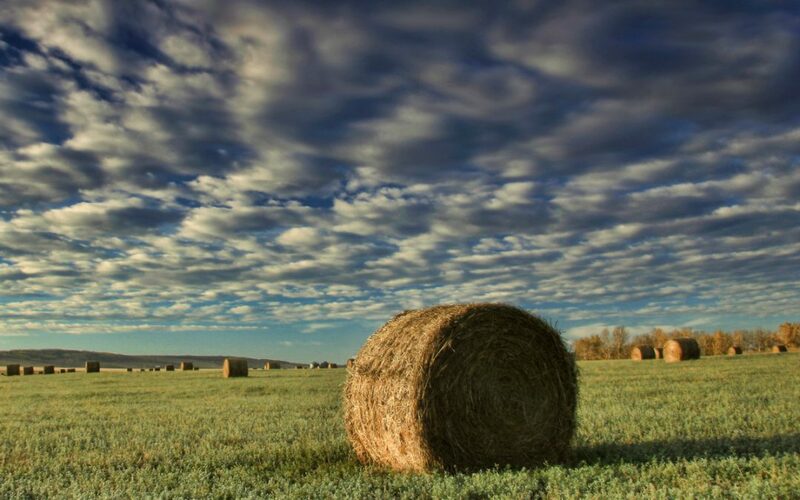 What role should alfalfa, hay and bluegrass have in the Colorado River Basin? Americans have always seemed to have a love affair with lawns. The problem is, as we moved west, we also fell in love with the landscapes of Arizona, California and Colorado—and then set about trying to change them. In an effort to make our homes and yards look like Illinois and Indiana, we planted grass and shrubs appropriate for wetter climates. Western farmers and ranchers, too, have always valued grass—from alfalfa to native hay—that can feed hungry livestock through the winter season. This mindset of grassy green abundance, however, has been periodically interrupted by western drought, affecting everyone from 1930s homesteaders to early 21st-century municipalities forced to implement strict water reductions. Rapid urbanization has now run up against a record-breakingly dry 16-year period, requiring a paradigm shift. Several of the fastest-growing cities in the nation are in the deserts of the West, and water from the lower Colorado River Basin irrigates some of the most intensively farmed areas of the planet. With seven U.S. states and Mexico dividing up 16.5 million acre-feet of water (the equivalent of 5.4 trillion gallons) and only 75 percent of that in average annual river flows to go around, we have a problem. As water demand outpaces supply in the American Southwest, the water used to irrigate alfalfa, hay and bluegrass turf is receiving public scrutiny, with rural values often pitted against ever-increasing urban thirst. Parched cities are finding ways to compel residents to lose their lawns, while farmers may soon be offered payments to transition away from thirsty crops or otherwise reduce use in order to free up some of their water supplies. A number of cities dependent on water from the basin—from Denver to Los Angeles—have some sort of turf removal plan in place, but Las Vegas has led the pack in this regard. Under the leadership of Patricia Mulroy, former general manager for the Southern Nevada Water Authority, the Las Vegas region began an aggressive turf removal campaign in 2003, putting more than $200 million on the table to pay residents and businesses to tear out their turf and replace it with less water-thirsty landscapes. The voluntary program is part of a four-pronged approach to water conservation in the Las Vegas region that also incorporates pricing, education and enforcement. It has been stunningly successful, resulting in the removal of more than 170 million square feet of “non-functioning” turf from front yards, golf courses, highway medians and resorts. As a result, Colorado River water consumption in the region has dropped by 30 percent—and per capita water consumption by 40 percent—even while the population has increased by nearly a half-million people. Turf reductions in the basin’s cities, however, won’t balance the system on their own, not when agriculture and food production uses 70 percent of the Colorado River’s water. According to the Pacific Institute’s 2013 report “Water to Supply the Land,” irrigated pasture and forage crops used primarily to feed livestock cover about two million acres, or 60 percent, of the basin’s irrigated area. Alfalfa alone, a protein-rich and water-intensive grass crop planted extensively from Wyoming to the delta in Mexico, covers more than a quarter of the total irrigated acreage. These flood-irrigated hay meadows and alfalfa fields consume more than five million acre-feet of Colorado River water each year—more than a third of the volume currently stored in Lake Powell. “If we are trying to map out our water future, we really have to get our arms around alfalfa and hay crops, because that is where so much of the water goes,” says John Fleck, an adjunct professor and writer in residence at the University of New Mexico’s Water Resources Program. Fleck is at work on an “optimistic book” about the future of the Colorado River, tentatively titled Beyond the Water Wars. Fleck and University of Arizona researcher Robert Glennon have proposed tweaking the system by developing flexible, resilient, market-based policy mechanisms that would allow ranchers and farmers to continue to thrive with less water while being compensated for the water they give up. For example, Glennon suggests in his book Unquenchable: America’s Water Crisis and What to Do About It that alfalfa farmers in the lower basin should be able to idle their land during the hottest summer months—when their crops use four times as much water but get a dramatically lower yield—and then turn around and sell or lease the water savings to other thirsty farmers or desperate cities, without jeopardizing their own water rights when they return to farming in the fall. The future of grass, whether turf or forage, will likely also be shaped by technology and best management practices. Converting to ditch piping and subsurface irrigation to reduce evaporative losses, or implementing regulated deficit irrigation, where crops are intentionally grown using less water than they would normally consume, are both practices that may ultimately be subsidized by municipalities that would benefit from the water savings. But flood irrigation in the upper basin still makes sense under certain circumstances, says John McClow, a member of the Colorado Water Conservation Board and general counsel for the Upper Gunnison River Water Conservancy District. For instance, in some areas along the Gunnison River, a tributary to the Colorado, flood irrigation contributes to a stable groundwater table that ultimately reduces infiltration of irrigation water. One long-term study conducted by the Western Landowners Alliance showed that flooding high mountain hay meadows actually creates a big sponge in river valleys, holding the water on the land, improving soil health, recharging aquifers, and contributing to a healthy riparian environment. And while revenues from hay production may be small in the context of state GDP, McClow points out that, at least in rural Colorado, ranching is a relatively large contributor to the local economy, both directly and indirectly through the view corridors and social fabric it provides. Although flood irrigation in the Gunnison Valley drains into the river, providing flows to downstream users in the Colorado River system, it’s a very different story in central Arizona, where farmers use Colorado River water to flood irrigate crops in Maricopa County, where return flows do not reach the river.